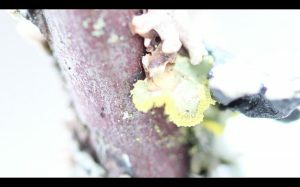 Symbiosis is a lyrical portrait of lichen, a fascinating organism arising from the close symbiotic relationship of fungus and algae or cyanobacteria (or both). 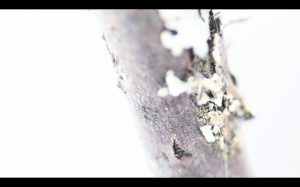 Filmed with one take on a crisp late winter afternoon, the video zooms on the hidden world of the lichen growing on a tiny branch of a tree. 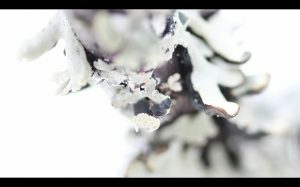 The soundscape of the video is derived from the original sound track of the take, heavily digitally modulated to create a musical sphere that in itself forms a symbiosis with the image. "Art, for me, means creating, but also getting a grip, in a holistic way, of what cannot be expressed otherwise. I am drawn towards the dynamics between constant change and momentariness, as well as the presence of history here and now."